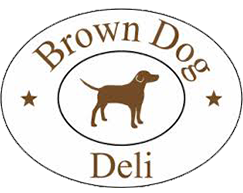 Click here to read more about Brown Dog Deli! 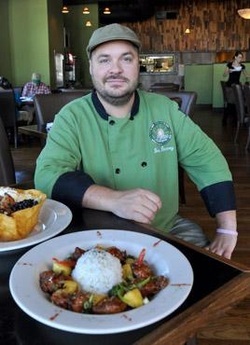 Cuisine artist, chef Wes, brings an experience that reaches far beyond his new hometown. Before moving to the lowcountry he began work on a popular GA restaurant named Plates on the Square and UnCorked. He was plucking fresh salmon from the oceanside markets in the state of Washington. Preparing the finest dishes for resort guests from the Painted Dessert to Olympic National Rain Forest. He also has made plenty of home-cooked barbecue for the good folks of the Carolinas, who take their smoked pork very seriously. And, of course, Wes has completely changed the menu at The Blind Tiger, and now he has brought the Brown Dog Deli to you right next door. According to Wes, you can't go wrong at either place! From this breadth of experience, Wes puts together a very diverse menu. The Muffaletta is un-paralleled in the city and his Curry Chicken Salad is another top menu item. In addition, he loves to incorporate great Asian influences and, most importantly, the great Southern BBQ cooking he grew up eating. You will find Wes at the deli every day of the week for almost every meal. He is devoted to his craft and the business, and it shows. Regular customers who have tasted all parts of Wes' diverse culinary creations will be glad to tell you they have never had a meal at the Brown Dog Deli they did not enjoy. Native Charlestonian and Johnson & Wales alumni, Brent Petterson started working in professional kitchens at the age of 14. That initial experience at Snee Farm Country Club led him down a culinary path infused with memorable chef mentors. After graduating from Johnson & Wales, Brent worked in a myriad number of restaurants including Percy & Willies, California Dreaming, & McCrady's (under famed Chef Phillippe). In 1997 Brent opened his own place, Brent's on Broad, a local favorite for breakfast & lunch for 15 years. Brent lives on James Island with his family and an apricot dog.